Now that we have the basics what does wither one of these mean? Basically, a Residential property can be a house, a multifamily property, an apartment or a condo, pretty much anything you’re allowed to live in, and offers some really good investing opportunities for a Real Estate investor to have multiple of them around, whether they chose to rent them or flip them, these kind of investments are great because they can be pretty solid and permanent, and also are quite easy and basic to handle, as the paper work for them can be quite simple. A residential property can become the easiest introduction to the real estate industry, as it is pretty straight forward. But does this mean a commercial property is not a good start? Not quite, a commercial property can be a bit more complicated but they usually bring great revenue as they are used to produce income, these can vary from a shopping center, to a convenience store, but here’s the catch, there are also some properties that can be called commercial while holding residents, apartment buildings. Here’s the thing, an apartment building can be considered a business because these guys are made to produce a ton of money and also need a bit more maintenance than others might. This kind of properties require more work and time than residential real estate does as you need to have different things in place for them to work, like permits, and heavy paperwork, but this kind of real estate usually brings up a lot of income to the owner as they are in constant movement. 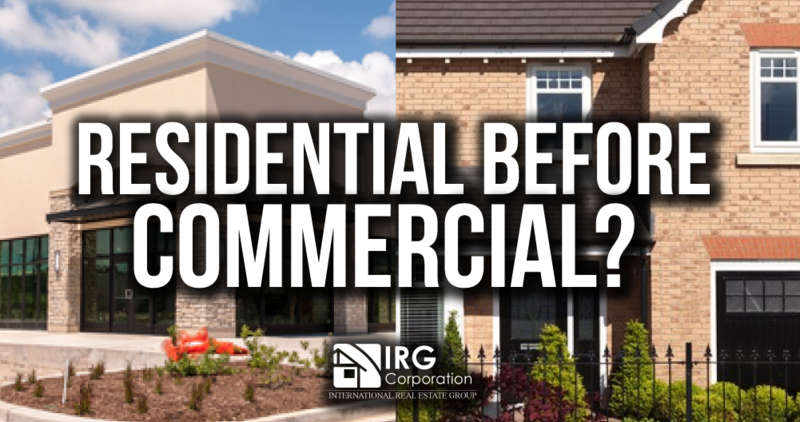 But the question still remains, should you choose residential before commercial when you are starting on the real estate investment field? It will depend on your goals overtime, but the easiest way to learn and have some good knowledge before you jump into anything else is residential Real Estate, as this will settle a base for you to understand what is it all about and actually be ready before you jump into it, so yeah maybe choose residential before commercial at first, just so you get your bases done! The thing is, there is no rush into anything, one advice everyone will give you is don’t jump into a big project if you don’t know what you are doing, so maybe don’t buy that big apartment building or that super expensive house on the beach if you don’t know much of the market, because it could and will most likely back fire you, go small, if you’re settled into commercial, get a convenience store, those are small enough for you to start and see if it works good for you, or start with a single family home and learn the basics! If you are looking for the best residential deals to put your money down on, check out our investment deals! we have something for everyone and you will find that they are perfect for the new investor! If you want to learn more about the Real Estate market in South Florida, join our Real Estate group and learn the secrets of success! How to Recover your Real Estate from Hurricane Irma!